Heat oil in a pan and splutter mustard seeds and add crushed garlic and curry leaves. Add chopped onion, green chillies and tomato and saute for 2 minutes. Then add chopped beans, turmeric powder, salt and 1-2 tbsp water and stir well for few minutes. Yummy and tempting thoran..loved those greenish colour. Nice variation with that tomato piece..Will try. 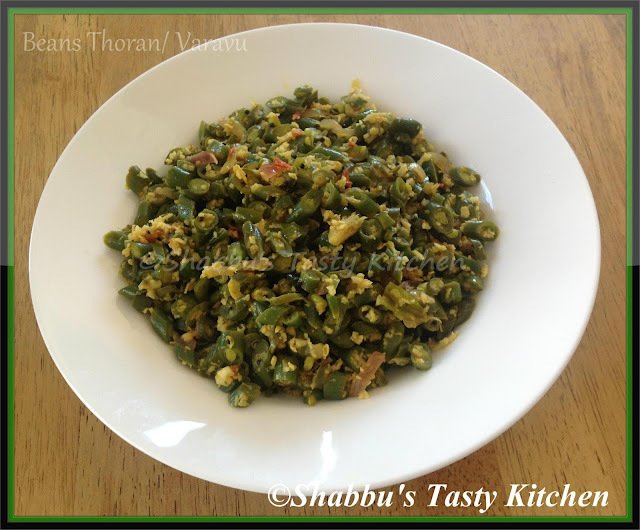 Healthy thoran,love to have with a bowl of rice. looks very tempting,perfect with rice! !